Irish Champ is a classic but simple dish made from mashed potatoes and chopped spring onions boiled in milk and butter. 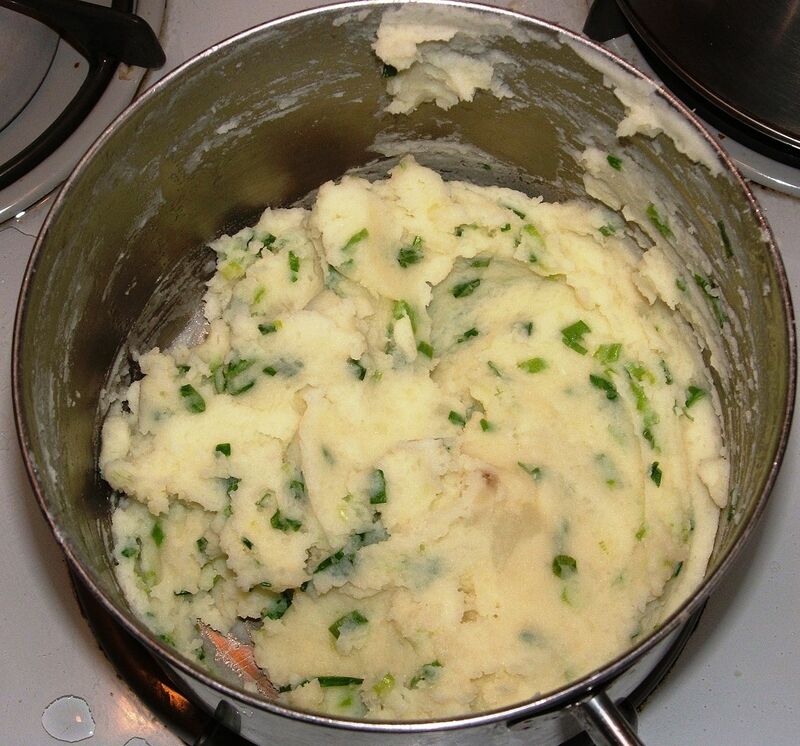 A Northern Irish dish, Champ is similar to Colcannon, another Irish dish made with mashed potatoes and cooked chopped kale or cabbage mixed with butter and milk. Many traditional Irish dishes are simple but filling food. Many involve some combination of potatoes, milk, butter, flour, dried fish, mutton, and greens. Irish Champ at one time was made with stinging nettles, a wild herb, (the stinging property disappears when young leaves are cooked), but today nettles are harder to find and used less often. The Irish Champ recipe is a very old one. By the turn of the 19th Century, most of the tenant farmers the southern part of Ireland were dependent on potatoes for food, especially through the winter. 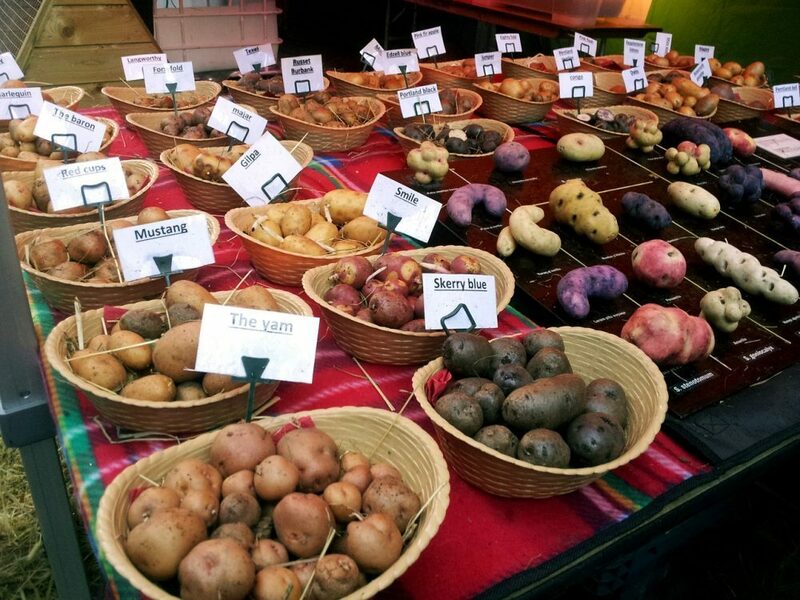 Potatoes had been introduced to Ireland in the 18th century as a novelty crop for the wealthy. The peasants did not like the potato at first and relied on a diet of mostly milk, butter, and grain, but over time they became accustomed to the potato, which was easy to store, long-lasting, and filling. By far the most common Irish potato grown in the 18th century was the Irish Lumper. By the 19th century, as potatoes increasingly became the only crop grown on small tenant farms, the way was opened for the disease to strike. Potatoes had become a mono-culture in Ireland. A ‘mono-culture’ is a situation in which only one type of plant is raised over and over again. Nature tends to abhor a mono-culture, introducing plant viruses and weeds to add diversity, which over time makes for healthier soil and healthier plants. When a country’s main food crop is a mono-culture, the danger of starvation is a real one. In 1844, newspapers reported that a new form of blight had ruined most of the potato crop in the Eastern United States. By 1846, three-quarters of the Irish potato crop failed due to that same blight. By 1847 the Irish began to die of starvation. Between 1845 and 1849 one million Irish men, women, and children died of starvation, and one million more emigrated from Ireland, many to the U.S. It might surprise you to learn that the potato is not native to Europe, Ireland, or North America. It was first discovered in South America in a very different and much smaller form. The first potatoes were cultivated in Peru, 7,000 to 10,000 years ago. Indians in the Andes region of Peru still cultivate ancient potato varieties to this day. They are tiny tubers, not easily recognizable as the potatoes we eat here. In order to make the starch in this small, wild potatoes edible, the Indians them freeze at high elevations, then thaw and cook them. The potato was first brought to Europe by Spaniards in the 16th century. Much as in Ireland, the potato did not catch on quickly as a food source, but once it did, potatoes became a very important food crop worldwide. Potatoes are easy to grow, easy to transport over great distances, and easy to store. Potatoes can be grown in soil too poor or rocky to grow grain. Potatoes can also be grown on steep hillsides. Today, potatoes are the world’s fourth largest edible crop, right behind corn, wheat, and rice. Over 5,000 cultivars of the potato are grown around the world. The potato’s popularity varies by region, and is mostly used as a side dish today. Another surprising fact about potatoes is that they are a relative of deadly nightshade, a highly poisonous plant. You might have seen deadly nightshade growing wild: a vine, it winds around other plants and has a deep purple star shaped flower that matures into a red fruit that looks like a tiny tomato. Every part of deadly nightshade is extremely poisonous. Potatoes are also related to tomatoes, another plant whose fruits we currently enjoy. Potatoes are grown as tubers underground, and when mature are not at all poisonous. However, green skin on potatoes does contain the poisonous alkaloid solanine, which in large enough quantities can cause sickness in humans. Even though potatoes are not poisonous when mature, they do retain that one link to their poisonous cousins. In today’s world, many countries have a surplus of food, so much so that modern people can become obsessed with weight loss diets. Due to the popularity of a variety of high protein, low carbohydrate weight loss regimens in Western nations, the humble potato has gotten a bit of a bad reputation, one that is completely undeserved. Potatoes are not fattening! In fact, potatoes are highly nutritious all by themselves. A large baked potato contains about 150 calories, large amounts of Vitamin C, Vitamin B3, Vitamin B6, and Folic Acid. Potatoes are also rich in minerals like Iron, Calcium, and Potassium, and have almost no sugar. Potatoes have almost no natural fat in them, no saturated fat, unsaturated fat, or fat of any other kind. When you make Irish Champ you add to the humble potato some whole milk, butter, and chopped green onions. In the end you end up with a dish which is nutrient-rich, has plenty of protein from the milk, and still weighs in at a mere 400 calories per serving. We’ve lost sight of this kind of nutrition today, but in times gone by it was no secret that a starchy dish with butter and milk would stick with a person through a busy day much better than a simple salad or a bit of cucumber. Another advantage of potatoes over meat protein is that toxins tend to settle in the flesh of large animals in a way that they don’t in vegetables. This is because large animals are the last creature in the food chain. When humans eat only meat they get no carbohydrate fuel to get them through the day, and instead have to burn their own stores of fat. In the U.S. in the 19th century this phenomenon was seen as a negative, not a positive, and was known as ‘rabbit starvation’. This was because in the winter, many people only had rabbits to eat and not much starch in storage that could make it through until spring. Potatoes keep very well in cold storage or a cool pantry. Because they are starchy when cooked, they provide lots of energy for people who work hard all day, without adding a lot of unnecessary calories. With such a dark history behind the potato and Ireland, it might seem odd that Champ (and it’s brother recipe colcannon) would be considered “Irish comfort food,” but it’s important to understand that the Irish that emigrated overseas took with them their way of cooking, their tastes, and their culinary comforts. Step 1. Cook the two pounds of peeled and quartered potatoes in boiling water until tender. Step 2. Drain and cover. In another pan, boil the bunch of chopped green onions in a cup of milk and a quarter cup of butter. Step3. Mash the cooked potatoes, gradually adding the milk, butter, and green onion mixture. Step4. Pile Irish Champ on a plate in a mound, making a well in the center for extra melted butter. Step5 (Optional). add grated cheese and salt and pepper to their Champ. Champ is especially good with fried sausages on the side. Champ is such a common food in Ireland that the Irish have incorporated it into a number of sayings. To say that someone is “as thick as champ” is to say that person is not terribly bright. In much the same way, to claim that someone is “as ignorant as champ at a wedding” is to call that person common and uneducated, since Champ is a peasant’s dish and not anything that would actually be put on a wedding table unless the wedding party was very poor. Today, people in the U.S. have largely forgotten the stigma attached to Irish immigrants and their tastes in the 1800’s, and instead, we celebrate the Irish and look back nostalgically on their cooking. Irish Champ in America is no longer a poor man’s dinner but rather an interesting part of immigrant culture. You may find it served on St. Patrick’s Day in the U.S. alongside Colcannon, Irish Stew, dark beer, and soda bread with currants. One important note: Irish Champ is a Northern Irish dish, colcannon is from the South of Ireland. For years serious bad feeling between British Northern Ireland and independent southern Ireland festered, causing outbreaks of violence. This tension is largely gone today, and it’s doubtful anybody would fight over which is better, Champ or colcannon, but you never know. When making Irish Champ it is worth remembering the humble beginnings of the Irish potato and all the people who depended on it. When we celebrate the Irish people, we appreciate being able to enjoy the comforting and filling dishes that they brought with them to our own shores and our own culture. Irish Champ deserves a place on the American menu, not just on St. Patrick’s day, but on every day.